This is something very rare. Something which the new generation might not get connected to. Comics in this era? 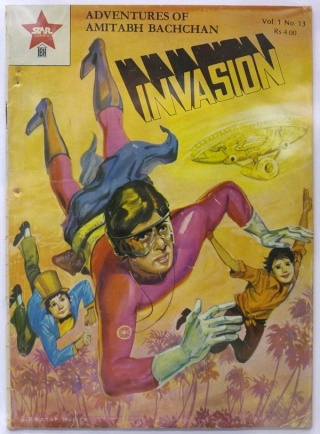 Here in this blog we are trying to decode one of India’s original super heroes which became a craze in 1980’s. This is all before our own Shaktimaan. There might be many Indian film actors have played super heroes in films but there is only one super star who was not only visible in the movies but also became famous as a comic character. We are talking about none other than the Superstar of the Century, Mr. Amitabh Bachchan. 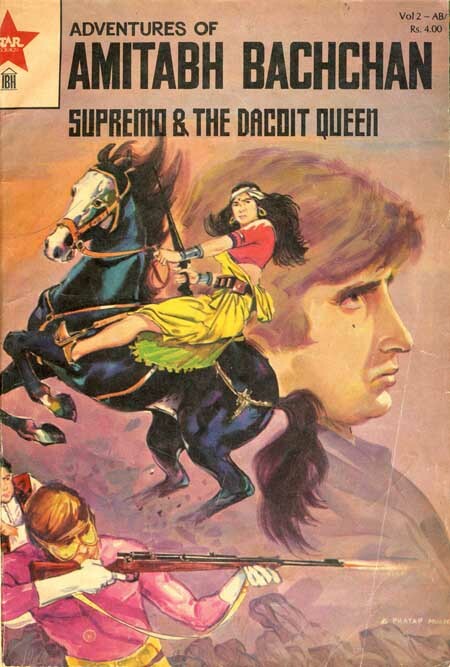 Supremo was the brainchild of Pammi Bakshi, editor of Movie magazine, who developed the series for her magazine’s publisher, Indian Book House (IBH), under their imprint Star Comics. The illustrations of ‘Supremo’ series were designed by renowned art director Pratap Mullick of Amar Chitra Katha fame. The biggest surprise of the entire project was that the script consultant of the Supremo series was none other than noted filmmaker and lyricist Gulzar. Supremo got its name from the famous actor Randhir Kapoor who gave the tag for superstar Bachchan. The series was written mostly by actress Sudha Chopra and freelance writers, with some contributions from readers. 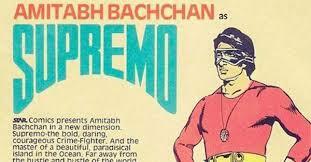 In the comics, Supremo was an alter ego of the actor Amitabh Bachchan. It is said that Amitabh had himself selected the look for his superhero character. The look of Supremo was designed on the lines of international superheroes wherein the character had a piece of brown cloth draped coyly around his waist, held there by a hip-holster. Supremo had two sidekicks – Vijay and Anthony which were two names synonymous with most of the characters played by Bachchan on screen. Apart from the daring looks, Supremo had a pet falcon as his scout and guide, christened Shaheen – an obvious take from ‘Allarakha’ – the one used in ‘Coolie’ which was blockbuster at that time and he had suffered life taking injuries during the shoot of the movie. Supremo didn’t have super powers but he had the combination of strength to defeat his human adversaries and intelligence to get out of traps laid for him. The comic series of Supremo that had a dream run for two years had to be shelved for various reasons better known to the creative team and the publisher. But this initiative created a space for super heroes in the years to come. Though there has been superheroes in comic strips, India still does not have a super hero and the Indian crowd still depends on Spiderman, Batman, Hulk and the likes.